parish priests; confessors Curé of Ars, born at Dardilly, near Lyons, France, on 8 May, 1786; died at Ars, 4 August, 1859; son of Matthieu Vianney and Marie Beluze." Jean-Baptiste now resumed his studies at Ecully. In 1812, he was sent to the seminary at Verrieres; he was so deficient in Latin as to be obliged to follow the philosophy course in French. He failed to pass the examinations for entrance to the seminary proper, but on re-examination three months later succeeded. 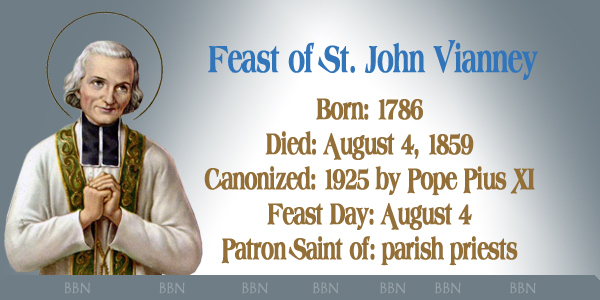 On 13 August, 1815, he was ordained priest by Mgr. Simon, Bishop of Grenoble. His difficulties in making the preparatory studies seem to have been due to a lack of mental suppleness in dealing with theory as distinct from practice -- a lack accounted for by the meagreness of his early schooling, the advanced age at which he began to study, the fact that he was not of more than average intelligence, and that he was far advanced in spiritual science and in the practice of virtue long before he came to study it in the abstract. He was sent to Ecully as assistant to M. Balley, who had first recognized and encouraged his vocation, who urged him to persevere when the obstacles in his way seemed insurmountable, who interceded with the examiners when he failed to pass for the higher seminary, and who was his model as well as his preceptor and patron. In 1818, after the death of M. Balley, M. Vianney was made parish priest of Ars, a village not very far from Lyons. It was in the exercise of the functions of the parish priest in this remote French hamlet that as the "curé d'Ars" he became known throughout France and the Christian world. A few years after he went to Ars, he founded a sort of orphanage for destitute girls. It was called "The Providence" and was the model of similar institutions established later all over France. M. Vianney himself instructed the children of "The Providence" in the catechism, and these catechetical instructions came to be so popular that at last they were given every day in the church to large crowds. "The Providence" was the favourite work of the "curé d'Ars", but, although it was successful, it was closed in 1847, because the holy curé thought that he was not justified in maintaining it in the face of the opposition of many good people. Its closing was a very heavy trial to him. But the chief labour of the Curé d'Ars was the direction of souls. He had not been long at Ars when people began coming to him from other parishes, then from distant places, then from all parts of France, and finally from other countries. As early as 1835, his bishop forbade him to attend the annual retreats of the diocesan clergy because of "the souls awaiting him yonder". During the last ten years of his life, he spent from sixteen to eighteen hours a day in the confessional. His advice was sought by bishops, priests, religious, young men and women in doubt as to their vocation, sinners, persons in all sorts of difficulties and the sick. In 1855, the number of pilgrims had reached twenty thousand a year. The most distinguished persons visited Ars for the purpose of seeing the holy curé and hearing his daily instruction. The Venerable Father Colin was ordained deacon at the same time, and was his life-long friend, while Mother Marie de la Providence founded the Helpers of the Holy Souls on his advice and with his constant encouragement. His direction was characterized by common sense, remarkable insight, and supernatural knowledge. He would sometimes divine sins withheld in an imperfect confession. His instructions were simple in language, full of imagery drawn from daily life and country scenes, but breathing faith and that love of God which was his life principle and which he infused into his audience as much by his manner and appearance as by his words, for, at the last, his voice was almostinaudible. * thirdly, healing the sick, especially children.